Wild Turkey 101 Proof 8 year Kentucky Straight Bourbon Whiskey is a popular Whisky available from Amazon.co.uk in 70cl to buy online. Visit Amazon.co.uk for the best price for 70cl of Wild Turkey 101 Proof 8 year Kentucky Straight Bourbon Whiskey or compare prices on our other Whisky products. A dark amber colour that offers soft, but rich aroma with hallmark caramel and vanilla scents and notes of honey and oranges. These scents follow in the mouth leading to a finish is very long, rich and full-bodied, powerful, yet soothing. 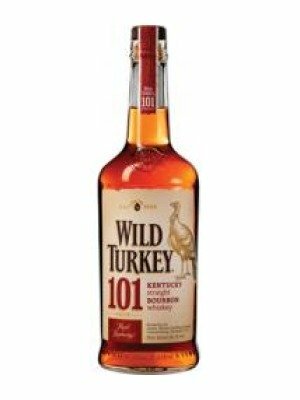 Where to buy Wild Turkey 101 Proof 8 year Kentucky Straight Bourbon Whiskey ? Wild Turkey 101 Proof 8 year Kentucky Straight Bourbon Whiskey Supermarkets & Stockists. You can buy Wild Turkey 101 Proof 8 year Kentucky Straight Bourbon Whiskey online in most retailers and find it in the Whisky aisle in supermarkets but we found the best deals online for Wild Turkey 101 Proof 8 year Kentucky Straight Bourbon Whiskey in Amazon.co.uk, TheDrinkShop, DrinkSupermarket.com, and others. Compare the current price of Wild Turkey 101 Proof 8 year Kentucky Straight Bourbon Whiskey in 70cl size in the table of offers below. Simply click on the button to order Wild Turkey 101 Proof 8 year Kentucky Straight Bourbon Whiskey online now.